Astrum Computer Services is proud to be a nopCommerce Silver Solution Partner. We can help you create an E-Commerce site that will take your online commerce to the next level. The defining benefit that Astrum will bring to your E-Commerce project is our experience in both Brick and Mortar and Online retailing as actual retailers. On staff, we have over 15 years of actual specialty retail experience that we bring to your project. Our knowledge spans the retail spectrum of E-Commerce management, sales floor customer service, buying, general management, fulfillment, call centers and much more. Layout, graphics design, logo creation or modification. Plugin creation for custom site behavior. Integration with existing inventory management or enterprise resource planning tools. 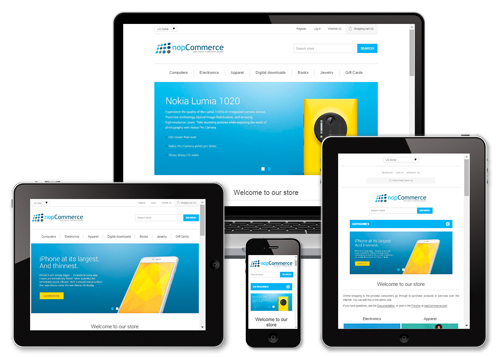 Support Mobile commerce with responsive layouts and themes. Automate the order fulfillment process. Automate inventory and pricing updates from a Point of Sale system. Integrate your inventory with your suppliers. Maximize sales by showing your supplier’s inventory on your site.